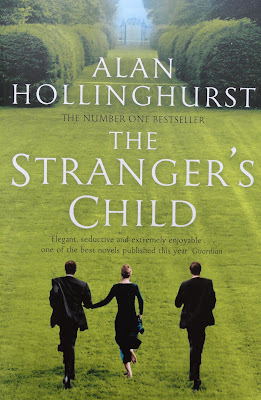 As this blog is titled "Books, Birkins and Beauty" and the "Beauty" side has been taking centre stage lately, I thought I'd try to even things out by writing a review of a book I recently read, Alan Hollinghurst's "The Stranger's Child". Published in the UK by Picador, it is available to buy in both hardcover and paperback at Amazon, with prices starting at £3.87. The photograph above shows the cover of the paperback edition, which has a lovely matte texture. The book received rave reviews when it first came out in June 2011 and it is the fifth novel by acclaimed British novelist, poet and Man Booker Prize winner Alan Hollinghurst. Hollinghurst being gay, the novel draws to many themes of gay interest, among which is key the development of gay culture in Britain during the narration's time span, which covers almost a century, from just before the start of the First World War to 2008. The novel is made up of five sections, each of which set at a different period of the century. While I found the first two sections, in particular, highly enjoyable with their references to a pastoral and idyllic England of the sort you might find in one of Rupert Brooke's poems (Brooke himself is often referred to in the novel), I felt the book lost some momentum in the third section, set in 1967, but then again got back on track by the fourth section and draw to a highly enjoyable and somewhat unexpected close in section five. The title refers to Alfred Lord Tennyson's poem "In Memoriam A.H.H. ": "And year by year the landscape grow / Familiar to the stranger's child". My favourite bit of the novel is in the second part, set in 1926. The poet Cecil Valance, from whom much of the events narrated are set in motion, has been killed in the Great War, and his friend and lover George Sawle is visiting his grave for the first time. "It struck George, has the chapel itself had on that first day, as a quietly crushing assertion of wealth and status, of knowing what to do. It seemed to place Cecil in some floating cortège of knights and nobles reaching back through the centuries to the Crusades. George saw them for a moment like gleaming boats in a thousand chapels and churches the lenght of the land." Cecil's epitaph is a verse by Horace, "Cras ingens iterabimus aequor", "Tomorrow we shall set forth upon the boundless sea". A verse, supposedly by the fictional Cecil, is quoted further on in the book: "It's the old company, all right, / But without the old companions". On the whole, a very enjoyable read, highly recommended!